For a couple of months we weren't doing large group weddings. For one thing I was off for a couple of months enjoying my new grand-daughter who is in New Jersey, and we were also having a settling in period for new staff and vendors. Now we're back with customised packages for large, and small groups. 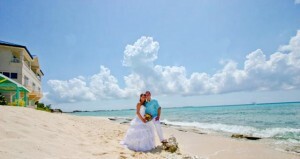 We have teamed up with an event management group and aim to give you an outstanding Cayman beach wedding experience. 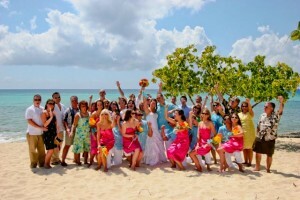 The key to a successful group experience at your Cayman cruise wedding is organisation. We arrange transportation from the cruise landing to the wedding location, for the wedding party, and for the rest of the group. The wedding party, in particular the Bride and Groom are picked up early and transported to our office (half-mile from the cruise landing) where they can relax and dress. Here they will finalise the documentation for their Special Marriage License, and I will go over their wedding script with them to make sure we have captured the vows they are requesting, and that all the readings etc. are in order. In large group weddings it is usual for a friend or family member to be involved in the actual ceremony. They could do a reading, or there could be a Unity Sand Ceremony, perfect for a beach wedding. If both mothers are present, I like to involve them in some way, its an important day for the parents of the bride and groom and I try to honour them. Many people who have a large group wedding will have arranged with us for a video-grapher. This is a very popular option if you're going to have a big party when you get back home. Most of our packages include one hour of professional photography, a wise investment for the sake of your wedding memories. This was a large wedding party, but large wedding parties can work for cruise weddings too. If you want hair and make-up before your wedding let us know, it could mean we have to give you a different time slot for your wedding. If you want to go on a tour, but you have a wedding to attend, I suggest the 11:15am half-day Stingray City trip, or a trip to the Cayman Turtle Farm. Many tour operators will pick you up at your wedding site. (Just bring a bag with your street clothes so you can change). Taking your group to lunch, or to a beach bar to hang out and snorkle are popular after-wedding activities. Ask us for recommendations, we have our favourites too. Don't forget to look at our a la Carte list, every large group wedding is customised to suit you. You can add chairs, arches, chuppahs, several types of music as well as wedding cake, fruit punch etc. What we can't do is set up a bar for you, champagne is part of many of our packages but this is for toasting only. We use mainly public beaches, so we ask our guests to respect the customs and the rights of their Caymanian hosts. For this reason, we do not do beach weddings during the Easter weekend because this is traditionally the time when Caymanians pitch their tents to enjoy several days of merry-making along our coastlines.